More and more sports fans are opting to watch their favourite NFL or NBA teams play via free streaming services rather than pay for expensive cable subscriptions. With a little bit of ingenuity, cord cutters can watch live streams of Thursday Night Football with the Twitter app, Yahoo Sports Mobile now live streams hundreds of NHL and MLB games and there are free apps that allow you to watch Australian Rules football and English soccer for free on your iPhone, Lumia or Android. Thanks to modern technology, you can now place a bet on your smartphone and watch the game after for free. The newly redesigned Yahoo Sports app for iOS and Android devices is a must-have for any fan of the National Hockey League (NHL) and Major League Baseball (MLB). 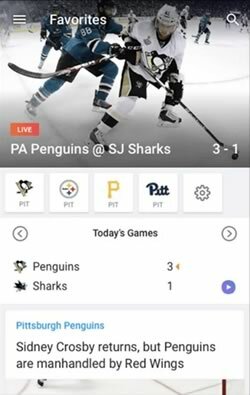 Users of the free Yahoo Sports app can now watch up to 4 live NHL games on their smartphone or tablet each week. Yahoo have also secured the rights to broadcast 180 games from the MLB season via their "MLB Free Game of Day" service on Android and iOS devices. Yahoo Sports Mobile provides a very useful live streaming guide that tells you where you can find free live streams for most sports. The app cleverly uses your GPS location to factor in blackout restrictions so you are only provided with recommendations for live streaming sources that are active in your area. NBC Sports Live Extra is a live streaming app that is available in the USA (or anywhere with a VPN). It is completely free and broadcasts live sporting events aired on NBC, NBCSN and Golf Channel LIVE. You can watch the likes of NHL, Formula One, the tennis French Open, the English Premier League and PGA golf. The app includes some useful side features and information as well: on-demand videos of past events, sport schedules with upcoming competitions, replays, push notifications. The NBC Sports Live Extra app can be downloaded from Google Play or the App Store on iTunes. 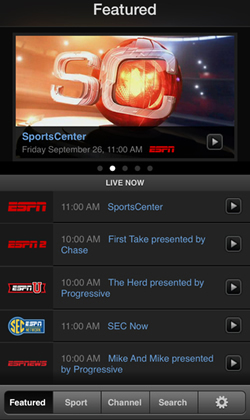 lESPN has its own live TV app available on both iOS and Android for US citizens. It covers the following channels: ESPN, ESPN2, ESPN3, ESPNU, SEC Network, SEC Network Plus and more. Anyone with a cable subscription can use their login details to access ESPN on their smartphones and tablets. ​In terms of sports and events covered, the app is really impressive. You can watch NBA, MLB, major golf tournaments, the biggest European soccer leagues such as the English Premier League, the Spanish Primera, the tennis Grand Slam and much more. 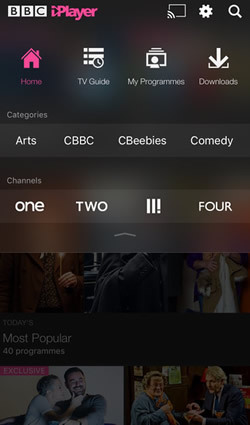 The British media giant BBC offers its own mobile app for live television. The BBC own the broadcasting rights to a wide variety of sports that are live streamed via the app, such as soccer, rugby, darts, snooker, golf and even major tennis tournaments like Wimbledon, the Australian Open and the Queens Open. You can also watch highlights of all the games from the English and Scottish Premier Leagues on their Match of the Day roundup program. The BBC iPlayer can be found in the iOS App Store and on Google Play. Live streams are available from within the United Kingdom although you can also access them outside the UK by using a SmartDNS or VPN service. With the YipTV platform, you can watch a number of TV channels in English and Spanish. The full list contains more than 90 channels that broadcast sports, TV shows, movies and much more. For full access, you need the Premium Membership that costs $14.99 monthly. However, you can choose the Free Membership and still watch about 20 channels without paying a dime. The YipTV mobile application is available for both iOS and Android to users from Puerto Rico and the USA. It works well with 3g and 4g, so you can watch even without access to Wi-Fi. 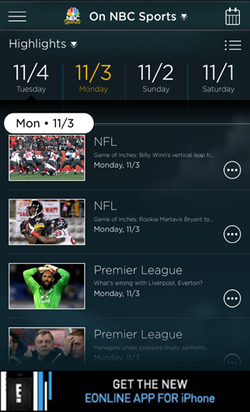 This app is available in the iOS App Store and is one of the best platforms to watch live sports for free. The Sports TV Live provides an access to more than 60 sports stations that broadcasts various events such as SkySports, Eurosport and much more. You can watch the likes of the Europa League, the Champions League, other soccer tournaments, cricket, tennis and more. There are useful side features like push notifications, game scores and stats as well. On top of that, new channels are added frequently by the Sports TV Live team. RTE is the biggest TV network in Ireland and they now have their own player for iOS and Android smartphones. The app features both live streams and replays of whatever is one. As you can expect, there are many local sports and events such as the matches from the Gaelic Athletic Association (GAA), Irish and UK horse racing (including Cheltenham), but also some major international competitions like the Olympics, the World Cup, athletics, European Champions League fixtures and more. The RTE player used to be open to residents of Ireland only, but is now available internationally both on the iOS App Store and Google Play. Certain restrictions depending on your location may apply, though. 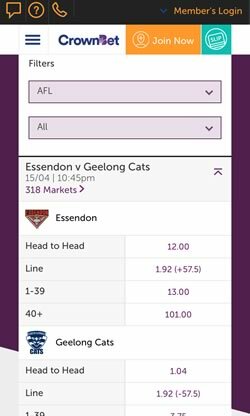 SportsBet is also an Australian sportsbook that has its own live streaming service available on smartphones and tablets. 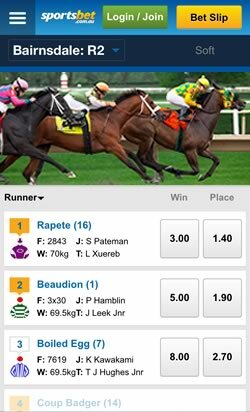 In this case, you can watch all Victorian horse races through the bookmaker’s app, including the Melbourne Cup and Spring Carnival. The software is available on iOS and Android for Australians only. The broadcasts are completely free, but you need a positive account balance. In addition to that, you can watch on-demand replays of past horse races. With the rapid development of smartphones and tablets, lots of web services and products can now be accessed on a mobile device. Live sports streaming is not an exception and there are many ways to watch your favorite team anytime, anywhere. 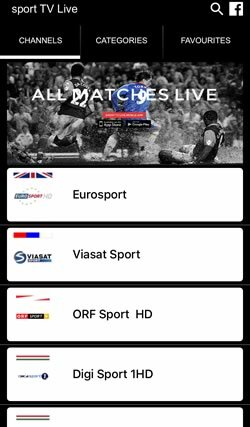 Whether it is soccer, basketball, tennis, rugby, horse racing or another sport, there most probably is at least one app that streams it live. Some of the platforms are paid, but many are free and provide a viable service. In this article, we will provide a list of the best free live sports streaming apps available out there. Of course, all of them require a decent internet connection to work properly.